Friday nights are the best time to go out, chill, relax and be with friends as you welcome the weekend. Mine started out with a few close friends who, before I arrived, were trailing on an 8-hour client meeting. We wanted to veer away from the usual Friday-alcohol-bar type of gimik (which I was very glad of, since I don't drink), so we called and invited friends over to join us as we indulge in Chocolate Fire. Chocolate Fire is a cafe/lounge/bar type of place where you can see a wide variety of chocolate deli. Mind you, their delicatessen isn't the normal type you'd see just anywhere, rather it's an exceptionally radical exploration of chocolate. The concept came to life 8 years ago and originated in Melbourne City, Australia. Aside from chocolates, they also offer sandwiches, vegetable salads, and several flavors of gelato. I was not able to take pictures of the place and the products as it were prohibited, so please forgive me. 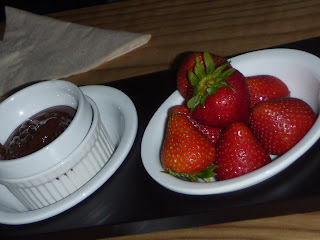 We just ordered a platter of milk chocolate fondue with strawberries, marshmallows, dried apples, bananas, and nuts, as well as a plate of dark chocolate fondue with huge strawberries. As I am not very much fond of chocolates but of strawberries, my eyes and taste buds were feasting on the huge strawberries that I wish I can savor bit by bit. 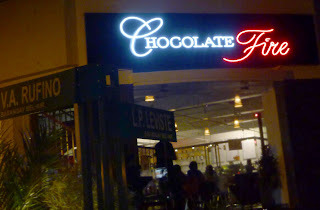 Nevertheless, if you are a chocolate lover, you'd surely be indulged in this place. Visit their website to see more of their products and corporate offerings. I hope Malaysia has a restaurant like tis! That chocolate fondue looks great, it's my all time favorite dessert! I love strawberries for dippers, but lately (because of my 7-year old twin boys and 3-year old baby girl) we're having bananas and pretzels, too, for dippers, lol! I only let them try it once, and they instantly fell in love with chocolate fondue. 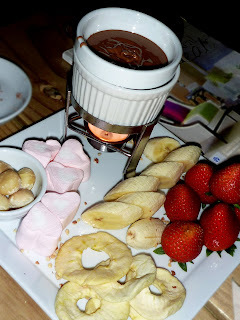 Now we're having fondue party (just the 4 of us, hubby is always on business trips)almost every week, lol!